There aren’t many NASA types at the National Space Symposium this week. This is the biggest aerospace convention of the year, and almost everybody is in Colorado Springs. While the focus is on “national security space” there has been plenty of talk about how space observations are mandatory for climate monitoring, where satellite phone and TV communications are headed in the future, and how emerging commercial human space flight will be affected by government rules and regulations. Most NASA people stayed home because of a restriction put into last year’s NASA budget greatly restricting the agency’s budget for conference attendance. This is the only conference I am going to this year, for example. It makes it hard to keep up with what is going on in the world. But enough whining, that is not my point today. I had a great conversation with the Air Force Research Lab guys about their X-51 hypersonic scram jet test which is coming up this fall. I am particularly interested in the development of this technology since it will someday enable aircraft travel vastly more efficient and faster than what we currently suffer through. Can you imagine being anywhere in the world within about an hour of takeoff? That is the kind of travel that is possible. The shuttle had an outstanding test last flight looking into the arcane science of how air closest to a flying vehicle (called the boundary layer) transitions from laminar to turbulent flow. Early results indicate we had a controlled transition around Mach 16 versus the usual Mach 8. This type of data is invaluable to the designers of future hypersonic aircraft. And it can’t be gathered in wind tunnels or any other ground test. Anyway, the X-51 is ready to take scram jet engines to the next level — This engine will run for up to 11 minutes which is a quantum leap past the current record holder of about 12 seconds. The flight will take place over the Pacific Ocean this fall. I can’t wait to hear the results. But even more than that, I can’t wait to get out of my trans-oceanic coach seat in one hour instead of eight! Keep up the good work guys — keep pushing the envelope! Update Sunday Feb. 22 . . . . The initiator of the email change has written and asked that I remove the original text. As you can see, I have complied with that request. I stand by my apology to the folks who have done great work in hypersonic research. Next week I am on the agenda of the NASA Project Management Challenge training event to give a talk on “The Power of Accepting Criticism”. This was a talk that I planned to give last year, but a conflict caused me to back out at the last minute. So up until last evening, I was feeling pretty good about having the speech ready, it was written a year ago, with only minor updates to polish it up. Now I think I’m going to tear that speech up and write a new one. Same topic, new info. All because of an email exchange I had last evening. On my blackberry I thumbed out a quick reply explaining my blog and felt pretty good that the note would assuage the email author. I did a tremendous disservice to those folks who have worked diligently in the area of hypersonic flight. A number of teams have launched test vehicles: Australian, Russian, others. The most impressive was the NASA Hyper-X test program which had two very successful tests about five years ago. Summarizing these efforts in two or three superficial sentences clearly demeans their achievements. I would offer a humble apology to those who labor in this field, particularly all of those who on the Hyper-X project. In review, it is clear that I have become lax in my technical explanations. It is the height of laziness to brush off a subject because it is hard to explain to the lay public and therefore not to make the effort. So I pledge to renew my efforts to be more technically precise in these posts while still attempting to make some of these subjects clear to the non-expert reader. Second, I promise, no more whiny blogs about postings on the internet. The nature of some of the discourse on the internet is simply a fact of twenty first century life which I am not going to be able to change and therefore it is unworthy of my complaint. Finally, no more putting down the public because they are not experts in the space field. My job here should be education, not criticism. Well, enough for one day. I have a speech to revise. As several people have pointed out, the shuttle has been used for aerodynamic testing for a long time, and the first shuttle was outfitted with special instrumentation for that purpose. And a lot was learned about the boundary layer, but a precise experiment was never performed on that subject. If we are to design future hypersonic aircraft and spacecraft, we need to understand this phenomenon in a very specific way. Precisely controlled data collection is required. That is what is going to happen on the next shuttle flight. 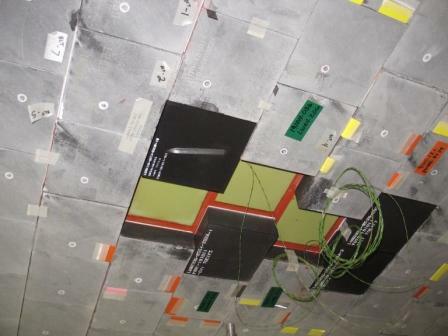 The older tiles have grayed with repeated flights, new tiles are shiny black, and the green painted aluminum skin is where tiles are yet to be installed. The wires hanging down are for the instrumentation. The black tile in the center of the picture has a quarter inch ridge down the middle of it, oriented crosswise to the airflow; that is our controlled trip mechanism. If this experiment is successful, there are two more iterations with larger steps on the test tile. Funny how it seems so simple, but it takes so much planning! If we are successful, a better understanding of the transition will lead to a prediction capability. This will make it possible to design the engines and aircraft for the next leap forward in aircraft! As I start this series, it occurs to me that “tripping the boundary layer” could be an article on social change – maybe I’ll do that. But for today it is an engineering subject. So buckle your seatbelt and hold your hat, we are off on an adventure in rocket science! Aviation has been driven by the desire to fly higher and faster. Great strides have been made, especially up to the middle 1960’s. But for the last few decades aircraft have been at a plateau in terms of speed and altitude. With the exception of rocket powered X planes, the boundary of high performance jets has been just faster than Mach 3 and up to about 100,000 ft. Even though there is the perennial dream of hypersonic transports carrying passengers across the globe in a fraction of today’s aircraft, we don’t seem to be advancing on that dream. Part of the problem is we don’t understand how to avoid tripping the boundary layer. There is precious little data at hypersonic speeds, and computer simulations are no good without data and the formulae derived from data to predict these things: garbage in; garbage out. So, to start this discussion off, let us define the terms. (What the dickens are we talking about?)! What’s a boundary layer and what does it mean to trip one? In aviation, the boundary layer is a thin film of air closest to the wing, body, or engine of an aircraft. At the molecular level, the air immediately adjacent to the airplane is dragged along with the plane. Infinitesimally farther away, the air is being carried along at some fraction of the speed of the airplane, and at a longer way away from the airplane, the air is not moving at all, or at least not being dragged by the airplane. That distant air is called the “free stream” and the close by air – which is affected by the passage of the aircraft – is called the boundary layer. Typically aerospace engineers consider the boundary layer to be that close in part of the air that is being dragged along by the passing of the aircraft at a speed of 5% or more of the airplane. These boundary layers are thin, inches or fractions of an inch. They are important because the boundary layer causes most of the drag and most of the heating when an airplane is in flight. So why is all of this important? Exactly at this time there is a large effort by many companies and government agencies to develop hypersonic aircraft. NASA has even sponsored a couple of test flights. The problem, as it is for all types of aircraft flight, is drag and heating. When the boundary layer over the wings or in the engine is laminar, there is low drag and low heating; and when the boundary layer is turbulent, drag and heating increase dramatically. All boundary layers can be “tripped” or transition from laminar to turbulent flow. In some of these experimental aircraft the engines [called SCRAM jets for Supersonic Combustion Ram jet engines] have only operated for a fraction of a second or a very few seconds. Why? Because the designers do not know how to cool them; they don’t understand when or whether the boundary layer inside the engine is turbulent or laminar. In some of these experimental aircraft, the engine begins to melt as soon as it is turned on; hence the extremely short operating times. This is no good for a hypersonic passenger aircraft which might carry a hundred people from New York to Tokyo in a couple of hours. Why do we not understand this phenomenon? Because it cannot be recreated in a wind tunnel or other experimental apparatus. The wind tunnels that have long enough flow durations to study this phenomenon run only up to about Mach 6. These hypersonic engines need to perform at Mach 8 or 10 or 12. There are “wind tunnels” that operate at high Mach numbers but only for fractions of a second; not long enough to understand the way in which a boundary layer works. Tomorrow I’ll talk about an experiment that will be on the next shuttle flight. An experiment which will study tripping the boundary layer. With this knowledge, the designers just might be able to make a major advancement toward hypersonic passenger aircraft. Around 1900 a young graduate student in physics was trying to do research on a problem that could earn him a doctorate degree. He started out studying the transition from laminar to turbulent flow in fluids. After months of work and study, he concluded that this problem was too hard. He would concentrate on an easier subject: atomic physics. His name was Niels Bohr and he won the Nobel prize for physics in 1922 for his work in quantum mechanics. And he was right; turbulence is harder. And we don’t understand it yet.